Q: My dog does [ insert favourite “misbehaviour” here ]. Is she trying to be dominant? Q: My dog does what he wants. He doesn’t respect me. How can I become a better leader? Q: How can I maintain a pack-hierarchy in my multi-dog household, so everyone knows their place? Q: Why use treats? Shouldn’t my dog just do what I want because I say so? Q: If I don’t punish my dog when he behaves aggressively, doesn’t that mean he’ll do it again? Q: My dog’s behaviour is a problem for me. What can I do about this? A: Finally, you’re asking the right question. 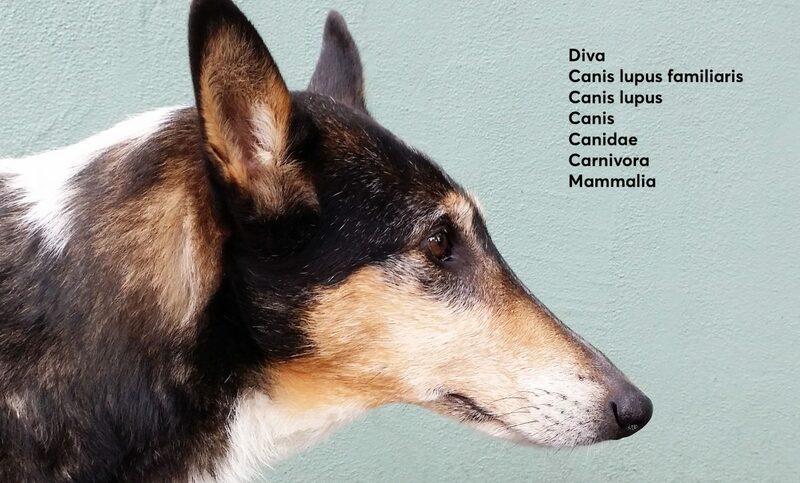 Your dog is a sub-species (Canis lupus familiaris ) of the gray wolf (Canis lupus) and belongs to he family of Canidae and the order of Carnivora. I’m not telling you this to boast about my knowledge of taxonomy (anyone can Google this), but because we really do need frequent reminders that our dogs are not human. I’m quite sure, having a bear or a gorilla in the house wouldn’t require repeated reality checks, but with dogs we seem to habitually forget what they really are. Your dog is a dog and will always behave like a dog, no matter how much you wish it were otherwise. Behaving like a typical member of one’s own species should not be a punishable offence. Now, I’d assume that bringing a dog into your home meant you were looking for a companion. Dogs are really good at that. But because they are still dogs, we usually need to take some action to make sure they don’t wreck the furniture, kill the cat, alienate our friends, offend the neighbours and attract law suits. If you have recently adopted a puppy, you need the same superhuman patience as new parents. And you have the unnerving responsibility to protect and nurture a new life. Can you imagine a parent placing a shock collar on their baby or pressing their little body to the ground until they stop crying? Pushing their face into their own poo because they had an accident during nappy change? How about yanking a toddler by a neck chain because they toddled in the “wrong” direction? Or maybe a bit of a whack under the chin or a knee in the chest or some yucky substance sprayed in their face? How else does that stubborn toddler learn to “behave”? How else are they going to respect you as their leader? And, if they are really rebellious, then we just strangle them until they faint or pummel them until they curl up in the corner. That’ll teach them. We do all of these things to dogs—animals who are no more able to comprehend what we expect from them than a 1- or 2-year old child—and no one calls the cops. No matter what age, breed or size your dog is, no matter what task you might assign to them, there is never any need or justification to make them fear you. I know it is not the most brutal methods I have to steer you away from. You don’t want to hurt your dog. But I want to hold up a big warning sign that when you enter the dark foggy forest of dog training you have a high chance of doing a Hansel & Gretel. The advice you will mostly come across is drawn from last century myths and the avalanche of books that have been written spreading those myths. The language may have changed and some methods are less overtly medieval in nature. But packaging a house of horror in gingerbread doesn’t make it any less dreadful or dangerous, just more insidious. Better to avoid the witch in the first place. The risk of being conned does not only come from external sources. What about your own tendency to blame your dog for having human intentions. Stubborn, disobedient, naughty, rebellious, dominant—how many times have you thought your dog “misbehaves on purpose”? It is not their brains that give rise to those thoughts, it’s yours. Funnelling human thoughts into canid brains has only ever led to confusion, frustration and misery—on both sides of the relationship. It may take a while to rid yourself of this, but you can safely drop the notion that you need to be the alpha dog or even a leader. Your dog is not going to usurp you. They are not lying in wait for you to drop your guard. Your dog is really just trying to figure out how they can get you to hand over some food or throw a ball or even just say a few nice words and scratch them behind the ears. That’s all they need to be happy. Fortunately, more and more people who live and work with dogs are done with folk knowledge and “dog training gurus” and are turning to fear-free and cooperative teaching and learning. Please join us on this exciting journey. This is the future and it’s already here. The science of animal learning and behaviour gives us all we need to create a functioning household of individuals, even if one or more of those individuals are not human. With a puppy under around 16 weeks of age your biggest advantage is the chance of prevention. Put all your time and energy into giving your youngster a ton of positive experiences, so they feel safe in this world. Go overboard with teaching them that nothing bad comes from human hands, that all the people and animals and things around them are no threat to them. Handle them with care, like you would a baby, but let them explore the world—under your gentle guidance and armed with treats—like they were a toddler. You may safe your dog from a lifetime of anxiety and yourself from the fallout. The positive experiences shouldn’t stop once your puppy has bumbled their way into adolescence and beyond. There is a German saying which I’ve always liked: “Wie man in den Wald hineinruft, so schallt es heraus”. It literally means “how you shout into a forest is how it’ll resound back at you” (FYI: Dark, dense German forests often have echoes; or at least that’s what I remember from my childhood). Sometimes your actions not only result in a similar response back though, but an exaggerated one. So much for the advice to punish your dog’s aggressive behaviour. Good luck with that. Squabbling between your canine house mates shouldn’t throw you into a leadership crisis either. 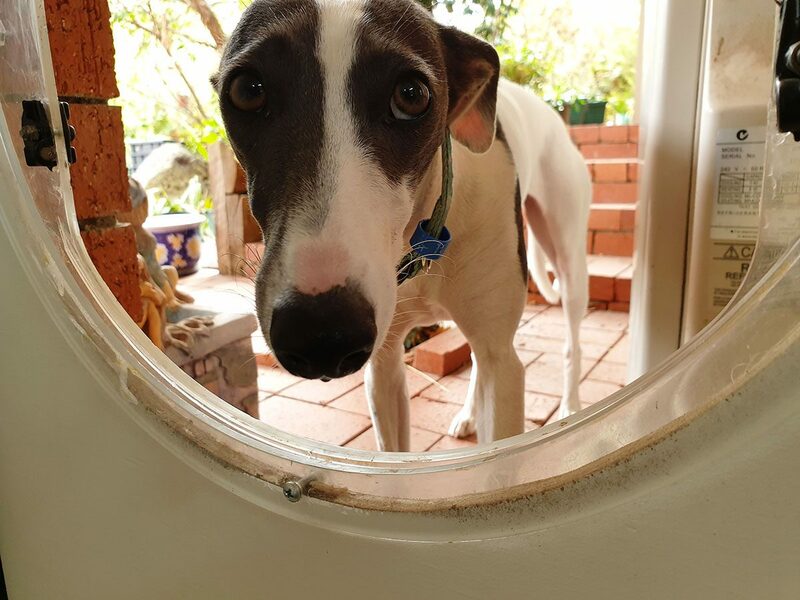 Dogs generally sort out who has priority access to which resource and when—food, toys, beds and more—without your interference. However, if your mediation is required because the furries are at loggerheads, don’t go looking for a hierarchy and most certainly don’t “support” one, or you risk starting a fire where there was only a bit of smoke. Relationships between individuals are more complex than a corporate company structure or a military hierarchy. If one of your dogs gets a little too “intense” over a resource, teach them that no one is a threat to the things they value and that good things come to them when the other dog(s) in the household get access to those same valued resources. Aggression is best prevented or reduced by not giving your dog a reason to be aggressive. Don’t threaten them, scold them and pester them but be a source of everything good in your dog’s life. Good food, play and toys, companionship and cuddles—it’s what makes your dog happy and they’ll love you for it. Use good food and play abundantly to reinforce your dog for all those things you want them to do. Your dog’s behaviour will match the value they get out of doing it. So, provide value and build up your dog’s skills, and your own, step by step. Then show off in front of all those misery trainers and their miserable dogs. Enjoy the look on their faces when your dog comes bounding back to you from mid-chase across a wide open field with tongue lolling and eyes sparkling in anticipation of the ham and cheese sandwich in your pocket. Your dog will be the happiest dog in the world and you their happy human. Being sick is no fun. No matter, if our ailment is of a physical or mental nature, it robs us of having a good life and doing the things we love. Anxiety, phobias or depression can be as debilitating as broken bones or battling a disease. And it’s no different for our dogs. But, just like us, dogs can benefit greatly from engaging in physical and mental activities, solving puzzles or playing games. It may start as nothing but a temporary relief or a distraction, but it may also grow into a newfound appetite for life. Often, the first step is the hardest, so here is some advice on how to get started with your dog. Does your dog shy away when someone tries to touch them, trembles at the vet or groomer or gets upset by noises? Does your dog seem withdrawn or inactive despite being neither physically incapacitated nor very old? Does your dog growl at people or other dogs, or worse? Dogs who worry about their environment most or all of the time have a stressful life. They often do not have the confidence, drive or energy to engage in playful or investigative behaviours. Instead, they stay where they feel safe and avoid attracting attention. If they are pushed out of their safe environment, they may respond with fearful or aggressive behaviour. The reasons for this can be multiple. A dog may have been born with a natural shyness or had adverse early life experiences. They may have suffered some form of trauma or been exposed to regular verbal or physical punishment. Or maybe they simply missed out on good socialisation during the critical first few weeks in life. Although it may seem the easiest option to just leave the dog alone, it usually does nothing to improve their quality of life and their mental health may deteriorate further. Also, the old “leave the dog alone” advice for any dog that shows aggressive behaviour doesn’t really work anymore these days, at least in our modern urban environments. Dogs live in close contact with us and conflict is almost guaranteed since neither dogs nor people are always in a position to get out of each other’s way. So, we better make sure our dogs are happy where they live and look after their mental health as well as their physical health. 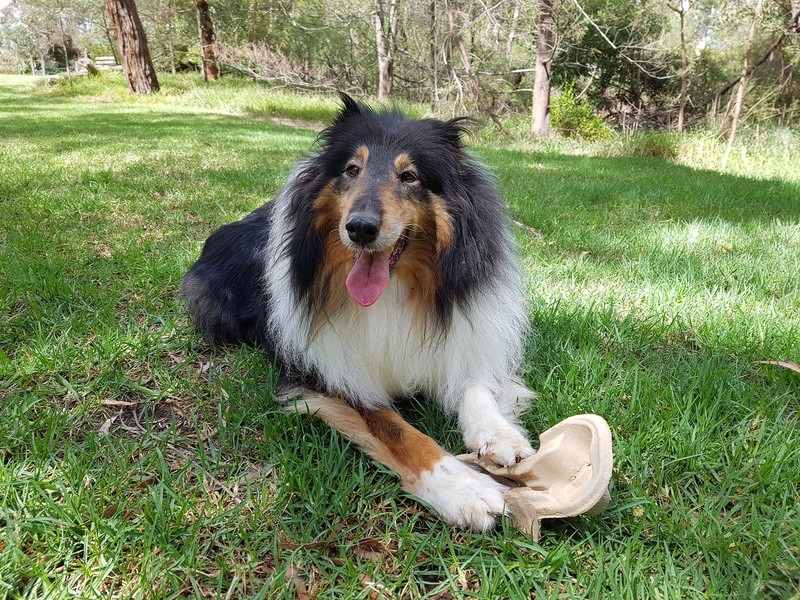 A great option for enrichment for anxious dogs is capturing and shaping a behaviour. It is a non-invasive—and therefore non-threatening—way to get your dog to do things. The initial behaviour can be as simple as your dog looking at an object near them, let’s say a cardboard box you just put on the ground. If you want to capture this behaviour, immediately praise (or say a cheery “yes!” or use a clicker, if you prefer) and give your dog a tasty treat every time you put the box down and your dog looks at the box. It will usually only take a few repetitions for the dog to connect the dots: I look at the box –> I get a tasty treat. Soon the dog may not just look at the box, but actually move towards it. After all, isn’t it interesting that looking at a box earns you a treat? There must be something about this particular box. So, let’s check it out! Eventually, your dog may offer other behaviours such as pawing at the box or biting it, so you reinforce these behaviours and eventually stop reinforcing merely looking at the box. You have shaped your dog’s behaviour from noticing the box to engaging with it. From there you might decide to shape ripping the box apart, so you only reinforce biting and no longer pawing. Next you reinforce vigorous biting and no longer gentle nibbling. Where you go with this is up to you and your dog. Maybe your dog discovers how much fun it is to rip cardboard boxes apart and doesn’t need food reinforcements anymore or they love finding some tasty morsels you have hidden inside the box. The important thing is that your dog is having fun. And, hopefully, you have fun watching your dog being happy. The following video shows some scenes of shaping engagement with an object, in this case a carry tray for coffee cups. 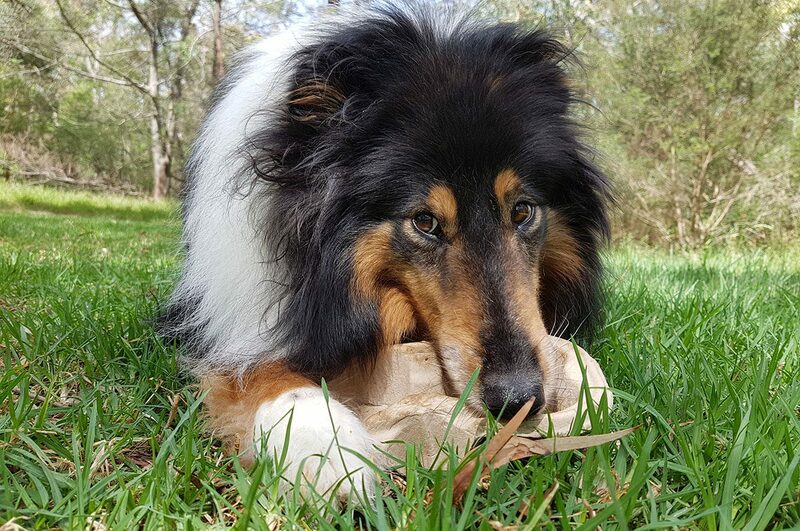 It started one day when a friend and I had take-away coffee at a park with Jezz, the anxious Collie. There was no particular agenda. Jezz simply had a sniff at the tray when I tossed it on the ground and it went from there. Now she runs at it, picks it up, tosses it into the air, sometimes rips it to pieces and seems to get a genuine kick out of doing so. That was all that mattered. Anxious Jezz having fun! The first crucial ingredient is the environment: There is a clearing surrounded by natural bushland, set along a creek in suburban Melbourne, where Jezz loves to hang out. In fact, I believe she would happily adopt this place as her permanent home. We frequently see the iconic Kookaburra and other native birdlife and there is even a hive of Australian bees being busy in a tree hollow. It’s a little oasis where Jezz feels safe and comfortable. Next, the reinforcer: I needed food which Jezz loves and wants more of. I mostly used freshly cooked or dehydrated chicken breast and sometimes cheese. Don’t make assumptions about what type of food your dog will work for. Test it by offering a large range of goodies. Most dogs prefer moist treats with meat, fish or cheese to dry kibble. The moment I saw Jezz sniff at the cardboard tray one day, I praised her with a cheery “Yes!” and immediately reached into my pocket for a treat. Jezz knows what reaching into my pocket means: There is a high chance she gets a tasty treat. How does she know this? Because she has experienced it many times over: I reach it into my pocket and out comes a treat. My timing was crucial here. If I had left even a few seconds pass before reinforcing Jezz with praise and food, she would not have made the connection between her investigation of the tray and the treat delivery. Being able to watch Jezz approach the tray meant I had to be vigilant and ready to reinforce her with food. If I had missed one or more approaches, I could have missed my chance entirely since without the food reinforcement there would have been no reason for Jezz to continue approaching the tray. To develop Jezz’s new found skill further I had to take it up a notch and be more discriminating about which behaviours I reinforced and which ones I ignored or reinforced to a lesser extent (lower value treats or praise only). Differential reinforcement simply means that we reinforce certain behaviours but not others. 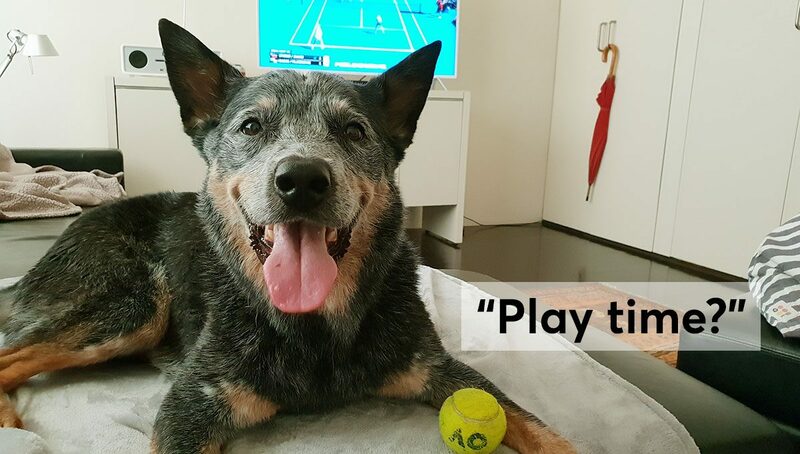 The “other” behaviours can be anything that the dog may also be interested in doing at the same time, but which doesn’t get us closer to our goal. In Jezz’s case I simply wanted to encourage any engagement with the tray that looked like play. Grabbing it and running with it or tossing it into the air was great, but she also enjoyed pawing it and chewing pieces off it, so I reinforced that too. Eventually I stopped reinforcing her for merely approaching and sniffing the tray. As a result, she did that less and, more often than not, went straight for the more playful behaviours of grabbing, tossing, running with the tray and—once she got a little tired—dissecting it. If my goal had been to teach Jezz to pick up the tray and bring it to me, I could have only reinforced her when she put her mouth on the tray but not when she was pawing it. Typically, after a dog has put their mouth or teeth on an object a few times, they start lifting it off the ground occasionally. Once the “new” behaviour, in this case “lift off” happens often enough, the simpler behaviours, in this case “mouthing” are no longer reinforced. Then we wait for the next behaviour to pop out, in this case “taking a few steps with the tray in her mouth” and once this occurs at a sufficient frequency, we no longer reinforce a simple “lift off”. And so on. When to stop reinforcing simpler behaviours and only reinforce the next closer approaches to whatever end goal you have in mind is a judgement call and, if made too early, can lead to frustration and eventually quitting in the dog. On the other hand, reinforcing the same behaviour for too long, can mean progress is very slow and the dog may even quit because it gets boring! Here is anxious Jezz with her new toy. Happiness can be found in the most simple things.